Gavin left on the 27th, an overcast and showery day. 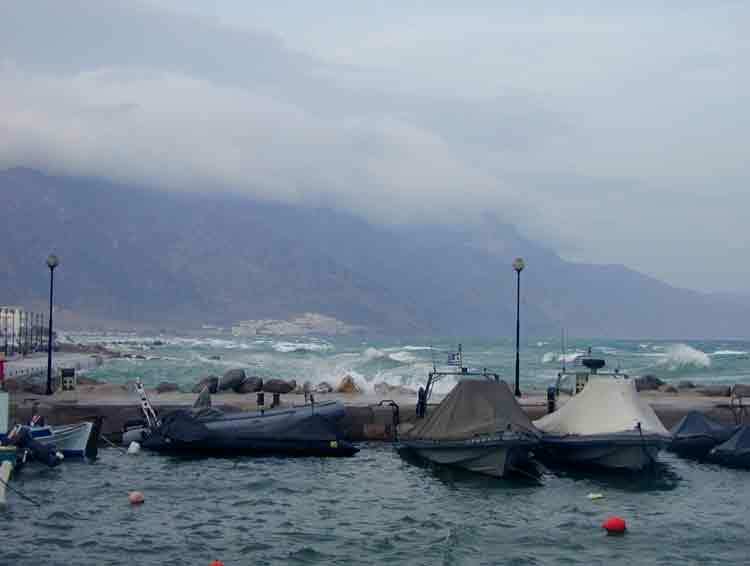 The wind was, unusually, in the SE when we left Kos marina. Leaving the berth, despite assistance from the marina staff, we managed to break a stanchion on the next door boat. On inspection it seemed to have been damaged before and a small push from our foredeck crew was the last straw. Naturally the owner didn't accept that we'd done him a favour in discovering an accident waiting to happen! The marina staff were very helpful in finding a stainless steel welder to provide a reasonable quote for the repair. Eventually we got away, sixty Euros lighter. We sailed around the SE coast of Kos to Kardhamena. It was a bumpy ride, with an onshore wind and uncomfortable seas, so we were happy to be welcomed at Kardhamena by a helpful port policeman showing us where to berth. The SE winds were making everyone nervous as most harbours are geared up to sheltering from the prevailing NW winds, but apart from a bit of surge we were comfortable. 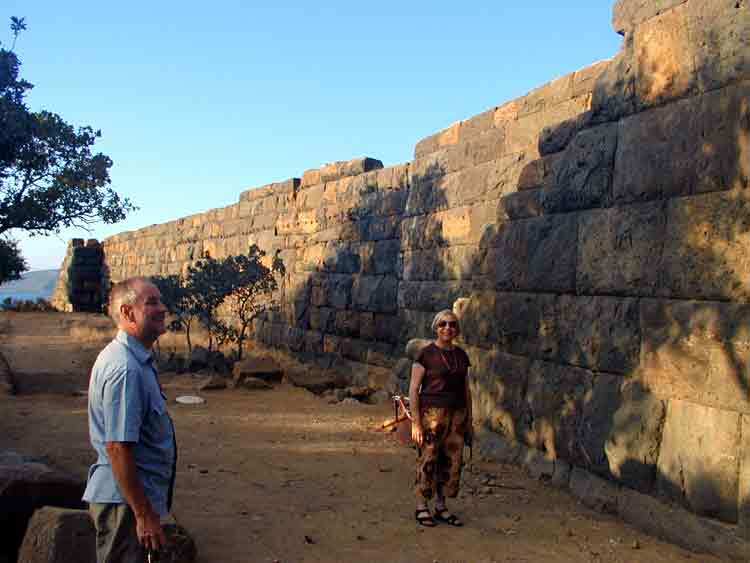 We picked up Lynda from the airport, just 7 kms from Kardhamena, on Thursday, which was also Paul's birthday. The weather was still cloudy and showery so we were happy to stay put and join the sad holiday-makers sitting in the bars watching football rather than laying on the windswept beaches. The skies were much clearer on Friday and the winds light, so we motored south to Nisiros. Lynda wanted to see the volcano and we were happy to return. No sooner had we berthed and gone ashore for arrival beers than we noticed a familiar catamaran arriving. It was Roger and Jenny on Demani, last seen a year ago in Ayvalik. We hadn't expected to see them in these waters and it was good to catch up with their news. We hired a car and had another fantastic day exploring the volcano and other sights on the island. This time the floor of the crater was much more active, with lots of holes in the centre filled with bubbling water. Walking over them was quite an experience. 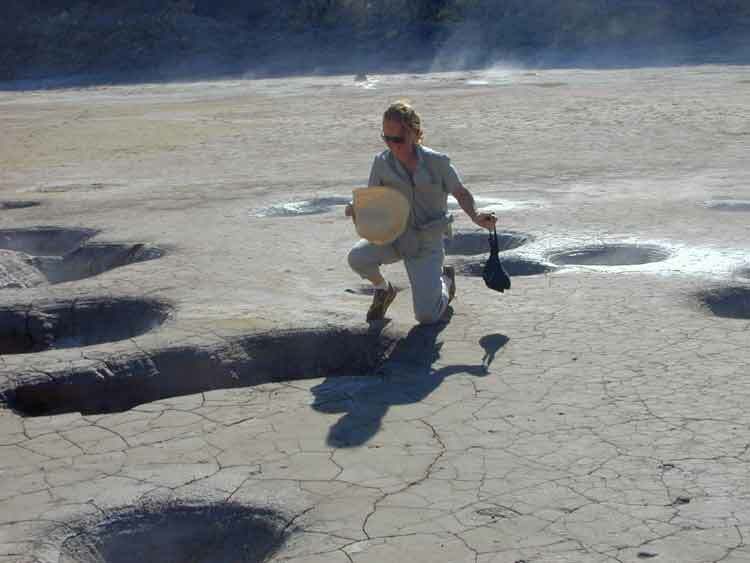 Hat being rescued from hole in crater floor! The winds were forecast to be the usual strong northerlies for a few days so we decided to head back to Kos, rather than going further south and risk not getting Lynda back to the airport on time. On Sunday we had an exhilarating beat north to the anchorage at Kamares on the SW coast of Kos where we'd been a couple of times before and knew the shelter would be good. From there we spent a day exploring on foot before a more gentle sail on Tuesday for our return to Kardhamena. In the last few days the winds have been lighter than expected and the daytime temperature warmer, though the nights are definitely cooler. Yesterday we spent the last day of Lynda's visit exploring Kos by car. Despite it's reputation as a haven for package tourism, Kos is a very beautiful island with lots of interesting sights. We managed to see the hilltop ruins of the Byzantine capital of Kos, the 2nd century BC Asclepion built in honour of Hippocrates, two knights castles and numerous excavations of ancient ruins dotted around Kos town. It was as exhausting as a hard day's sailing!